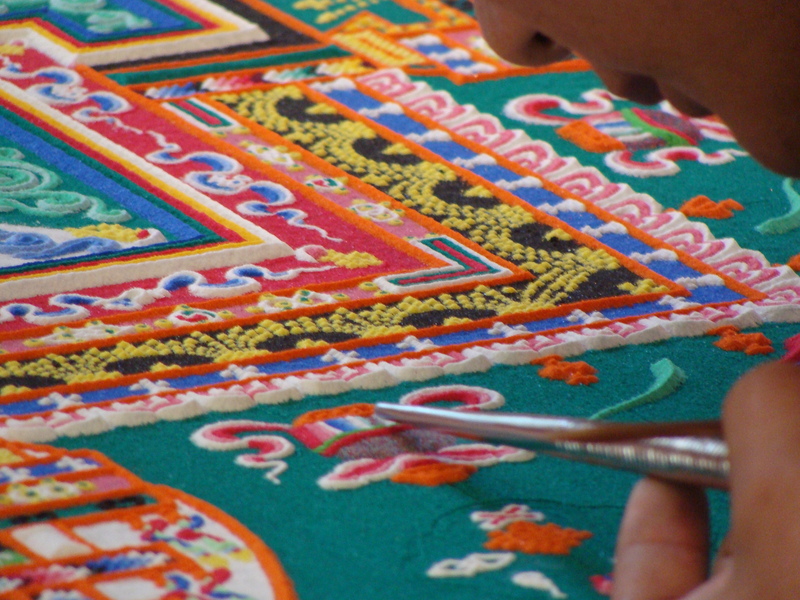 So you can probably take a look at the Tibetan Buddhist monks, working on that mandala, and figure out that patience is hugely necessary to achieve results. Lots and lots of patience (and a lack of any allergies). And not just the patience to painstakingly create a masterpiece, but the patience to learn the craft involved. I don’t know all the facts about mandala-making, but I don’t suppose you can take a three hour mandala-making webinar and expect to produce something as intricate as what I saw come together that day. And what I noticed, as the monks hunched down, carefully picking up a tool, thoughtfully choosing a color, is that there was not one moment–not a single moment–that was rushed. It was so very, very deliberate and purposeful. Nothing else seemed to matter except that little spot, and the proper placement of those colored grains of sand. There was a quality of the sacred in it, and I watched in respectful silence. So my dream board reminds me to be patient; good things (like a masterpiece of words) come to those who wait. But it also reminds me to work purposefully, and not rush my dream. It will all come together in its own time. Oh man, I’m a dream board junkie. I’ve made a few dream boards for myself, one for my current WIP novel, and one for Creativity Diet (posted on my fridge, where else?) but I did not know about this Oprah thing. I’ll have to check it out. As for patience, it may be a virtue (even my hero Yoda advises patience…and control), but it is definitely NOT my super power. Apparently dream boards all over the place–and if y’all have a minute, take a peek at Trisha’s new site, Creativity Diet. The perfect challenge for us writerly (and sedentary) types! 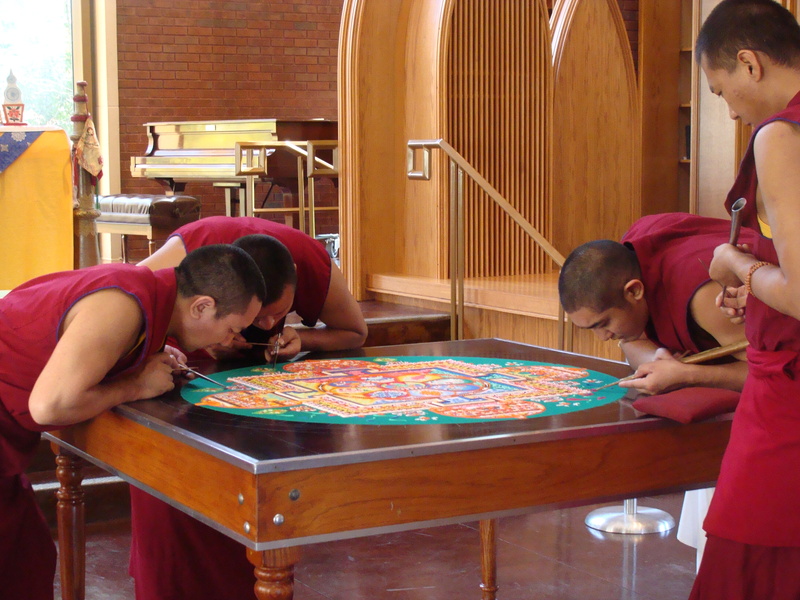 Reading this post and looking at those monks, I envisioned you joining them. You sneezed and blew it all to…well, then you started laughing and couldn’t stop and…well, don’t stop writing. Your work is better than that mandala. This is a great reminder – “work purposefully, and not rush the dream.” Part of the reason why I write stories in addition to novels, is because there is a more immediate sense of accomplishment, of gratification. The story still might take a month to write, but that seems like nothing compared to the year(s) a novel takes. And I laughed out loud at Linda’s comment, too. Because seriously? I was SCARED TO DEATH that I would sneeze! Did you write this post especially for me? It feels like you did ;), even though I know you didn’t. Apparently, from what I hear….the waiting never ends! Hey, now THERE’S good news, huh? *groan*. Shipoopi!